I’m really big on note taking strategies that allow students to decide what is important and be as creative as possible in the process. It may be purely semantics, but when I see the phrase ‘taking notes’ I think of writing down someone else’s ideas, verbatim, in the same form and structure that they were delivered in. 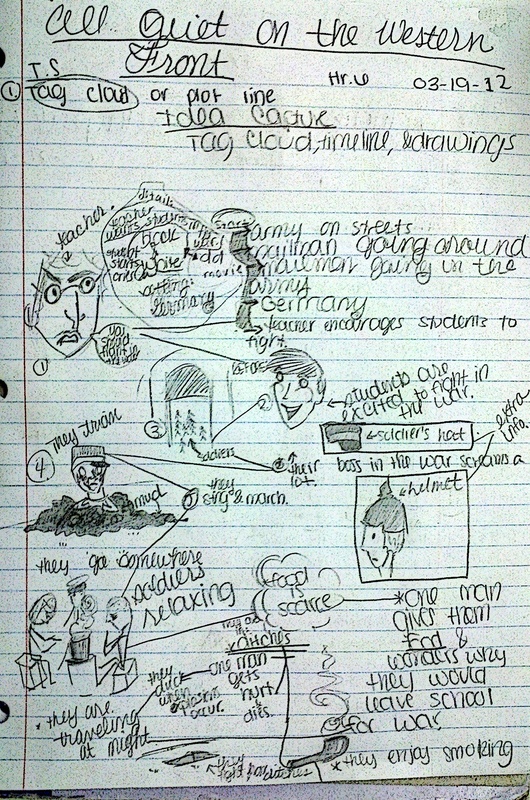 In my classroom we use idea captures, simply graphic/visual devices that record one’s ideas as they think. Idea captures can be, but are not limited to thinking maps, graphic recordings, info graphics, and tag clouds. By the time we spend a few months together, students start to recognize which idea captures work best for them given the content and they start to mash them together as hybrids and even create their own original designs. Students are allowed to think about how they want to think which gives them greater ownership and subsequently greater levels of engagement. It is less stressful than answering 30, 40, 0r 50 questions designed to make you pay attention to the movie. This lets student decide what was important and they are left to emerse themselves in the story without having to stress about the answer to the next question. Idea capturing is an inherently creative process that results in artistic works. Artistic works can be hung on a wall where it will constantly be re-engaged with while notes sit in notebooks never to be seen or heard from again. Art wins. I laughed whole-heartedly every time I visited this student’s desk to check on her progress. She makes connections between a 1930’s work and 2010’s social media. 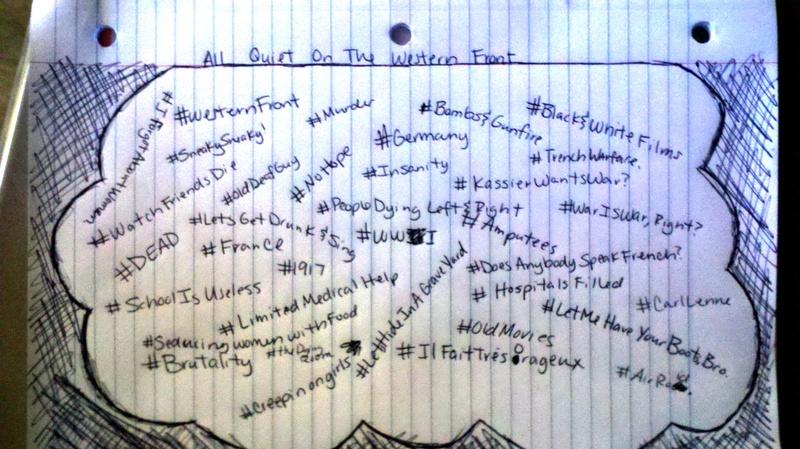 Yet, it’s more than just humor… this tag cloud really paints a vivid picture of the #Brutality of war, specifically #wwI in this case, the #Bombs&Guns and overall #Insanity of #TrenchWarfare. This is a very cool plotline/timeline that has the additional element of illustration, which really brings it to life. Given the chance to create a final polished draft, I’m sure this would be an amazing work (it is as it is). Yet, the marvel to me is that this was created as she watched in the moment. The level of engagement these students need to have to be creative in the moment is astronomically high… and it’s not my expectations but their own that drive this creative process. If you’ve tried anything similar while showing movies or reading in class, please do share your experiences.